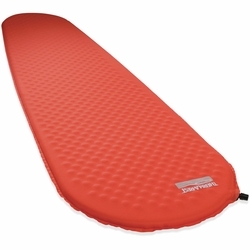 Therm-a-Rest ProLite Sleeping Pad. Now featuring Therm-a-Rest's exclusive Atmos™ Foam to further reduce weight and boost compressibility, the ProLite is the lightest and most compact three-season mattress available. Self-inflation keeps set-up super-easy and its die-cut foam packs small, easily fitting inside the most ultralight packs. It’s ideal for high-mileage, high-speed journeys where every gram counts. Stuff sack included.